To enlarge the graphic, please click. 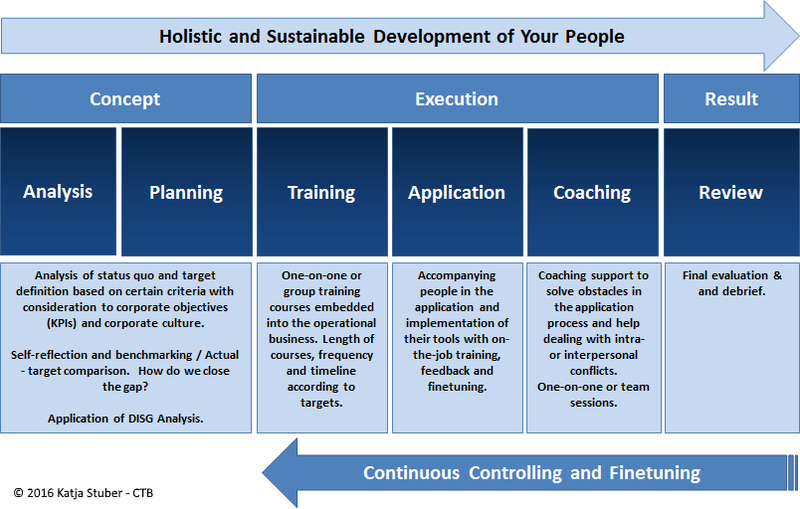 Even the very best training doesn’t lead to sustainable, long-term and efficient development of your people when it is not tailored to the individual needs and then being followed up upon. Great methods and tools that we learn in training sessions must be applied consistently and recurrently in our daily business. Only then, these new tools become automatic to us and we actually develop ourselves to a higher level. To help ensure that the investment in your company’s most valuable resource, its people, will pay off and that your people take a dynamic and sustainable path towards development, my work for and with you will be based on a holistic approach. After identifying the actual needs in your organization, we’ll set smart goals and I will create a customized development plan that includes tailor-made training courses for the individual needs of your people. We will also develop effective methods for applying and implementing these in their day-to-day business. This includes on-the-job training, feedback sessions, and more specific trainings or individual coachings. I will accompany your people’s development with passion and absolute commitment. Let us work together – call me for a kick-off! After identifying the actual needs in your organization, we’ll set smart goals and I will create a customized development plan that includes tailor-made training courses for the individual needs of your people.